On the surface carbohydrates seem like a simple matter. But what are they actually, what is the difference between “simple” and “complex” carbohydrates, what place do they have in your diet and why do you need both? Carbohydrates are one or more of several kinds of sugar, because sugar isn’t just sugar, there are numerous types of it: glucose, fructose, maltose and many more. Whatever kind of sugar a carbohydrate contains, your body breaks it down to glucose, also called “blood sugar.” It’s the most simple of all sugars and fulfills several functions in the human body. When we talk about fitness, glucose is the major fuel source for demanding activities like fast running or heavy weightlifting. The difference between simple and complex carbohydrates is in how many sugars a carbohydrate contains. Monosaccharides contain one sugar and the best example here is the above glucose, that the human body uses for fuel. Disaccharides contain two sugars. Table sugar, the one you use to sweeten coffee, is an example for them, as it consists of glucose and fructose. Polysaccharides are the most complex sugars, as they come with three or more sugars. They also are called starches and occur in plants, because of the way plants store energy. Foods that directly comes from plants, like bread, vegetables, noodles and seeds, therefore contain a lot of complex carbohydrates. The more sugars are in a carbohydrate, the longer it takes your body to break it down to glucose. This is why complex carbohydrates keep you satiated for longer. Simple carbohydrates, on the other hand, your body breaks down faster and you get the energy more immediately. For these reasons many health enthusiasts avoid simple carbohydrates and go only for complex. But not all simple carbohydrates are bad and not all complex carbohydrates are good. Some fruits mainly contain simple carbohydrates, but they also come with vitamins and “phytonutrients” – nutrients that aren’t vitamins, but still play an important role in keeping you healthy. In contrast, white bread is a source for complex carbohydrates, but the bread is so white because the flour it was made from was cleaned to achieve that effect. This cleaning process also removes all nutrients in the flour except the carbohydrates. This gives us some idea about how to choose carbohydrates. The worst choice would be sweets like candy bars that come with nothing but simple carbohydrates and little or no nutrients in addition. These won’t give your body anything beyond a fuel that won’t keep it satiated for long, which is why fitness-minded people sometimes call them “empty calories”. 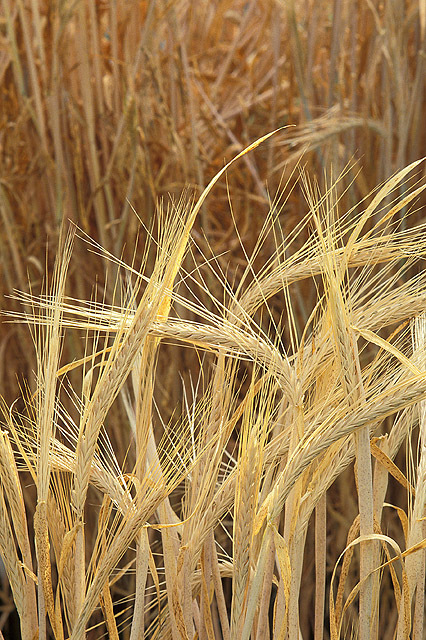 A healthy carb choice would be a source of complex carbohydrates made from whole grains. Those still contain all the nutrients that make complex carbohydrates healthy and keep you filled up for quite a bit. There is a big variety you can choose from here, as everything made from normal flour can also be bought as a whole grain product: bread, pasta, cereals, cookies etc. When you need some immediate energy, let’s say right before a workout, have some fruits. They are a great source for simple carbohydrates, because they give your body a boost almost right away and come with those vitamins and phytonutrients on top of it. Pictures courtesy of Dag Endresen and the United States Department of Agriculture. Some people claim, eating industrialized sugar and taking vitamin pills makes a good equation. That can’t be right, or is it? No, it isn’t right, because there is more to fruits and vegetables than vitamins that make them healthy and some research also shows that the vitamins from pills don’t work as well as natural vitamins in food. Nice article, basically what I tell people all the time as well. You just might wanna add “good” times when to consume what kinda carbohydrate. For example, I like to east food with complex carbs most of the time so I have a longer supply of glucose but before a workout I like to have a fruit for a quick boost and in the morning as well, to restore glycogen quickly after losing about 80% (if I’m correct) at night. Excellent point, Nino! I think that warrants an article of its own.